Be the first to share your favorite memory, photo or story of Carmie. This memorial page is dedicated for family, friends and future generations to celebrate the life of their loved one. Carmie Lloyd, 91, of Eldorado, passed away, Tuesday, July 24, 2018 surrounded by her family. 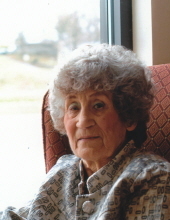 Carmie was born in Boxville, KY on October 29, 1926 to the late Newt and Molly (Shelton) Casteel. She was a nurse, where she worked at Fountainveiw Nursing Home and as an OB nurse. She was a member of Scott Street Baptist Church. She is survived by a daughter, Michelle (Curt) Morris of Eldorado and a daughter-in-law, Mary Jane Lloyd of Eldorado. She is also survived by five grandchildren: Stephanie (Jeff) Jones, Cindy (Tim) Brown, Mark (Amanda) Lloyd, Brenna (Chris) Miles and Cassidy Rice and eight great grandchildren: Noah Jones, Logan Jones, Breanna Dorris, Bryce Dorris, Callie Lloyd, Allie Lloyd, Gibson Miles and Wrendan Rice. Carmie was preceded in death by her son, Ronnie Lloyd. Funeral services will be held on Thursday, July 26, 2018 at 12:00 PM at the Watson Funeral Home with Curt Morris officiating. Burial will be in Wolf Creek Cemetery. Visitation will be from 10:00 AM until service time at the funeral home on Thursday. To send flowers or a remembrance gift to the family of Carmie Lloyd, please visit our Tribute Store. "Email Address" would like to share the life celebration of Carmie Lloyd. Click on the "link" to go to share a favorite memory or leave a condolence message for the family.